Nasa has successfully landed Curiosity, a car-sized rover, on Mars in a triumph for space exploration which could establish if life ever existed on the Red Planet. After a journey that had lasted eight months, and covered 352 million miles of space, Curiosity performed a series of aerial acrobatics before landing safely near the equator. Minutes later Curiosity sent back pictures showing one of it wheels, and its own shadow on the Martian surface. 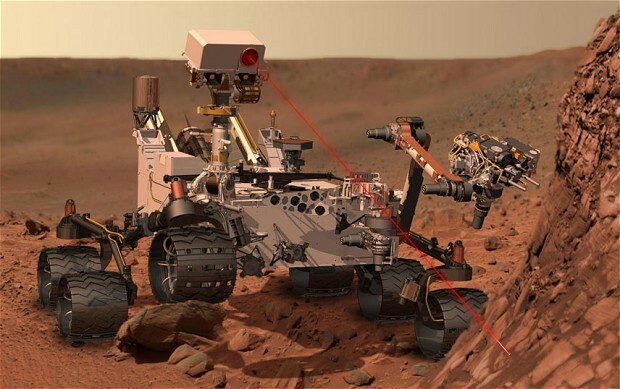 Curiosity is Nasa’s seventh landing on Earth’s neighbour but the most ambitious and expensive. Curiosity will search for evidence that Mars may once have held the necessary building blocks for microbial life to evolve. It has an array of sophisticated chemistry and geology gadgets for analysing soil and rocks. It also has cameras and a robotic arm with a power drill, and a magnifying imager that can reveal details smaller than the width of a human hair. Samples will be analysed using a state-of-the-art onboard laboratory. Curiosity will face several weeks of health checkups before taking its first short drive on the Martian surface. Curiosity will look there for basic ingredients essential for life, including carbon, nitrogen, phosphorous, sulphur and oxygen.